Understanding Russia A Cultural History | Free eBooks Download - EBOOKEE! Russia's global importance is undeniable. After a brief period of decline after the Soviet Union dissolved, the Russian state has reemerged in the 21st century with a geopolitical influence that rivals some of its most significant eras. Yet for as much as Russia demands the attention of Western policy makers, there remains uncertainty about Russian objectives on the world stage and confusion about what motivates the leaders who direct this immense land. Even as Russian art and music captivated the larger outside world, for many in the West, Russia and its people seemed enigmatic, shrouded in mystery. To a surprising extent, it still seems to be. Stretching across two continents from the Baltic Sea to the Pacific Ocean and occasionally beyond, Russia is unique on the world stage and has been for centuries. It is neither fully European, nor fully Asian. For most of its history, it has been more of an empire than a nation; a dynamic power whose expanse and continued expansion was both at the basis of its greatness and the essence of its greatest struggle. For much of the country's history, Russian artists, philosophers, revolutionaries, and rulers have sought to define what it meant to be Russian and to promote a culture and identity that could bring both unity and legitimacy to this massive political state. While Russian history has been shaped by centuries of triumph and tragedy, progress and despotism, glory and revolution, the cultural developments fostered by this political turbulence prove an enduring legacy. From the earliest recorded history of the Russian state, its people have sought to define their place in the world. And while we may try to make sense of Russia through its political history, in many ways a real grasp of this awe-inspiring country comes from looking closely at its cultural achievements. Painting and architecture, literature and music, theater and film, fashion and food-these and other topics chart the evolution of Russia's national identity in fascinating ways. To study Russian culture is to discover how Russia today is rooted in a history that extends beyond the Soviet era and relies upon a culture that bridges the era of the Romanov Tsars and the Bolshevik Commissars who overthrew them. 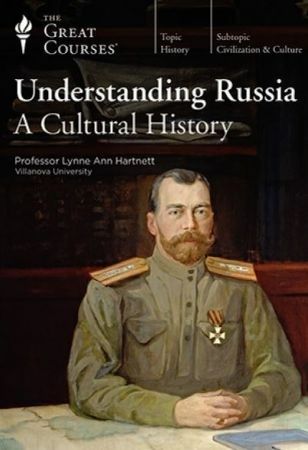 In Understanding Russia: A Cultural History, award-winning professor and Russian historian Lynne Ann Hartnett of Villanova University guides you through hundreds of years of Russian culture, from the world of Ivan the Terrible to the dawn of the Soviet Union to the post-war tensions of Putin's Russia. Blending history with cultural studies, these 24 illuminating lectures are designed to bring you closer than ever before to the Russian people-not just the authoritarian rulers like Peter the Great, the Romanovs, and Stalin, but also the everyday men and women who sought their own meaning in the poetry of Pushkin, the comfort of early folk tales, the faith of medieval iconography, the avant-garde films of Eisenstein, and more. In a time when the eyes of the Western world are constantly drawn to Russia, it's amazing how little many of us really know about its culture and its people. These lectures will help you finally understand the complex, thrilling, and undeniably fascinating Russian spirit. "Efforts to discover an organic Russian cultural identity spurred much of Russia's artistic achievements," notes Professor Hartnett. And, as you'll discover in Understanding Russia, it's a cultural identity influenced by a variety of enduring themes that stretch from the beginnings of the land known as Rus' to the start of the 21st century. Russia's shifting relationship to religion and the Orthodox Church. The Rise of the Tsar: In 1480, Ivan III ("the Great") declared Russian sovereignty, and the country found its apparent destiny in the hands not just of a grand prince, but a new Caesar, or "tsar." The Romanov Dynasty: The Romanovs, who came to power at a time of foreign invasion and civil war, ruled Russia for more than 300 years. They inherited the peasantry's traditional reverence for the tsar as their rightful ruler; commoners didn't blame their problems on him but on Russia's noble landlords. The October Revolution: When the Bolsheviks came to power in 1917, they found a way to take advantage of "popular aspirations" to impressive effect. Presenting the old culture as backwards, antiquated, and unjust, the new Soviet culture was said to be the most modern and progressive the world had ever seen. The Great Patriotic War: World War II, for Russia, defined not only a generation but the entirety of Mother Russia. Tied to monumental victories of the past, the "Great Patriotic War" was seen as the latest in a proud line of Russian heroism and achievement-a victory won not by an individual but by the Russian people. The culture of queuing for goods and services that defined everyday life for ordinary Soviets, especially in its impact on women. "If you've ever enjoyed-or hoped to enjoy-the treasures of Russian art, literature, theater, and film, each takes center stage in these lectures," Professor Hartnett says at the outset of this grand cultural inquiry. Understanding Russia puts you in the fascinating company of a range of novelists, painters, poets, filmmakers, impresarios, composers, revolutionaries, and intellectuals, each of whom shaped Russia in myriad ways. Sergei Eisenstein, the filmmaker whose techniques (in films such as Battleship Potemkin) revolutionized the language of cinema and inspired generations of film auteurs. "The Romanov tsars may be long-dead and buried," Professor Hartnett says," and the Soviet Union may be gone for good. But beliefs rooted in Russia's long history and its rich culture-these endure." Professor Hartnett's course is, above all, about connecting the past to the present we're currently living: a world in which Russia's global power and influence continue to grow. She keeps this relevance at the core of Understanding Russia, injecting many of her lectures with personal anecdotes from her own extensive cultural scholarship and experiences in cities like St. Petersburg and Moscow. In addition, her lectures feature period illustrations, photographs, maps, film clips, and other visuals that add layers of depth to this intellectual adventure. These lectures also go a long way toward making Russian culture a little less enigmatic and a little more relevant to our own distinctly Western culture. No comments for "Understanding Russia A Cultural History".